Here are instructions for installing Ubuntu on devices (phone and tablet). Target devices under active development are here. Community-driven ports to a much wider set of devices (including installation instructions) are here. These ports are not officially supported. Installing Ubuntu for devices deletes all data (including applications and data such as contacts, photos, and etc.) from the device. An optional procedure is provided below that backs up the Android apps and data to a local file. There is no guarantee that a restore will succeed. "Ubuntu for devices" is released for free non-commercial use. It is provided without warranty, even the implied warranty of merchantability, satisfaction or fitness for a particular use. See the licence included with each program for details. Some licences may grant additional rights. This notice shall not limit your rights under each program's licence. Licences for each program are available in the usr/share/doc directory. Source code for Ubuntu can be downloaded from archive.ubuntu.com. Ubuntu, the Ubuntu logo and Canonical are registered trademarks of Canonical Ltd. All other trademarks are the property of their respective owners. "Ubuntu for devices" is released for limited use due to the inclusion of binary hardware support files. The original components and licenses can be found here. Ubuntu for devices is still under development. Installing an Ubuntu for devices image may make your device unusable. Important features may be missing or broken. New images may introduce new features and may break existing features as development continues. Ubuntu for devices does not yet provide a reliable replacement for your current handset, phone or tablet. See Release notes for details. Here you learn how to prepare your Ubuntu Desktop system. After these steps are completed, you can connect your device to the Desktop and start an installation from the Desktop. You need to install the ubuntu-device-flash package. This is published in the phablet-tools PPA. You need to install the ubuntu-device-flash package. This is published in the Ubuntu universe archive. Ensure the universe archive is enabled. The SDK PPA provides additional tools needed to install Ubuntu for devices. Tools are provided for installation on Ubuntu Desktop starting with 12.04 Precise. On your computer, press Ctrl+Alt+T to start a terminal. Note: there is a no-longer updated version of the phablet-tools package in trusty/universe. Please use the PPA instead. The ubuntu-device-flash package is your main tool for installing Ubuntu for devices. Press q to quit the help. The phablet-tools package provides a Desktop tools useful when working with a USB-connected Ubuntu device. For example, click-buddy creates a click package and runs it on the device, phablet-screenshot takes a screenshot from the device and saves it in your current directory, phablet-bootchart creates a bootchart image, and more. Installing ubuntu-device-flash also adds two important Android tools you frequently use: adb and fastboot. fastboot: Provides a terminal connection over USB when the device is booted into the bootloader. Before you install Ubuntu, you should save some key data. This includes backing up your Android apps and user data and saving some data about your device to make it easier to reinstall Android later. Saving Android data over USB from your Ubuntu Desktop requires first enabling Developer Mode and USB Debugging from the Android OS, as explained next. Here, you enable Developer Mode on your device. Navigate to Settings → About phone | About tablet | about. Select the option available on your device. Tip: Some earlier Android versions may not require this step. Tap Build number seven times. A pop-up informs you that you have succeeded. Here, you enable USB Debugging. This is required for a USB terminal connection from your Desktop to your device. After enabling DeveloperMode, the Developer options item is exposed in the Settings page. Enable USB Debugging. When a device is connected, you will be prompted in Android to authorize it. Physically connect your enabled device to your Ubuntu Desktop over USB. On Android, accept the prompt to Allow USB debugging for the specified computer. Tip: If the device does not display, try running adb kill-server first. Now, the device is fully connected to your Ubuntu Desktop for development/installation operations. Before installing Ubuntu for devices, you can optionally create a backup file on the Desktop that saves your Android applications and data. You can use this backup file later to restore your applications and data if you decide to reinstall native Android on the device. Tip: To restore Android from the backup, see Reinstalling and RestoringAndroid. In Android, authorize the backup as prompted. A file containing your backup is created in your current working directory named: ./backup.ab. Save this file securely. You may want to reinstall Android later. To do this, it is helpful to write down and save key data. This data helps you open the right Android web page to download the files needed to restore your device to Android. You can obtain this information from the Android device’s /system/build.prop file. This device is type “flo”. The device type is used (automatically) to select the correct image in an Ubuntu image channel. The device type is also used to differentiate images on http://cdimage.ubuntu.com/ubuntu-touch/daily-preinstalled/current/. This build ID is “KOT49H”. This identifies the version of the installed Android OS. You can use this data to pick the right Android OS version if you want to reinstall Android. To install Ubuntu, you must first “unlock” the Android device bootloader. Warning: Unlocking deletes all data from the device, including apps and other data. You may want to create a backup first. You must first have enabled USB Debugging in the Android OS. Tip: When the device is booted into the bootloader the screen displays the green Android robot lying on its back with its front panel open and a highlighted Start menu item. Accept the terms of unlocking displayed on the Android device. Complete the first use Android setup steps, entering minimal information: Android and its data is about to be deleted during the Ubuntu install. Here you take the final steps that install Ubuntu. Warning: If your device is encrypted you must perform a full factory reset before installing ubuntu. This also will delete all data from the device, including apps and other data. You may want to create a backup first. You can perform a factory reset via the settings screen. Look for Backup & reset option on the latest versions of Android or tap Privacy if you’re using Android 2.3. When you install, you'll need to name the Ubuntu device image channel used to obtain the image. For guidance on which channel is best for you check out the Channel selection guide. Tip: After installing, you can always switch to another channel. Power the device off with the Power button. Tip: The --bootstrap option is normally only used when installing Ubuntu the first time. It requires that the device is booted to the bootloader. After Ubuntu is installed, one uses the ubuntu-device-flash command (without the --bootstrap option) while the device is booted to Ubuntu. Wait until the reboot is done. In most cases no input from you is required. The process takes some time. First, an appropriate image is downloaded to ~/.cache/ubuntuimages. Tip: Occasionally delete the cache of downloaded images (in ~/.cache/ubuntuimages) to free up disk space with: ubuntu-device-flash --clean-cache touch. Then, the parts of the images are deployed to the device. Ubuntu is deployed to the devices as a “recovery” image. Then, the device boots from the recovery image and installs Ubuntu as the normal OS. Finally, the device boots into Ubuntu for devices. If you intend to use your Ubuntu device for development and to simplify access to it (through scripts or the command line), you might want to enable the developer mode. To do this, go to Settings → About this device → Developer mode. This allows you to access your device via ADB or directly with SSH, when the device is unlocked. The phablet-shell command, provided by the phablet-tools package, is an easy way to SSH to your device. Some of the commands mentioned below (particularly those using adb shell) will assume that Developer mode is turned on. After installing Ubuntu, upgrades to newly released images and apps are automatically provided through Settings → Updates. Tip: You can configure such updates to never install automatically in Settings → Updates. This device is on channel devel, which is shown to be currently an alias for utopic. The version is 299. By default the system is read-only. You can switch to read-write mode, although this disables Ubuntu system upgrades. The main purpose for this is developing the Ubuntu system directly. This is not required for developing apps or using the system normally. Recovering from read-write mode is possible but requires reinstalling the system from scratch. Warning: Switching a device to read-write mode (and/or recovering from it) is an advanced feature and may result in complete data loss. It also disables automatic over-the-air delta updates. Accepting a full over-the-air update after making a device writable may undo changes you have made. The system reboots in read-write mode. Now that you have Ubuntu running on your phone, what should you do to get the most out of it? You can browse or search for more apps or scopes to install on your phone from the Ubuntu Store. To access it, swipe up from the bottom edge on the Apps dash screen, then press the Store button. Scopes can be installed to provide easily searchable content in addition to the Apps, Music and Videos scopes that are provided by default. Apps will be added to the Apps scope automatically, and you can pin them to your launcher for easy access any time. Developing apps and scopes for Ubuntu is fast, easy and free! Once you download the Ubuntu SDK you can follow along with our tutorials for writing your firstapp or your firstscope. 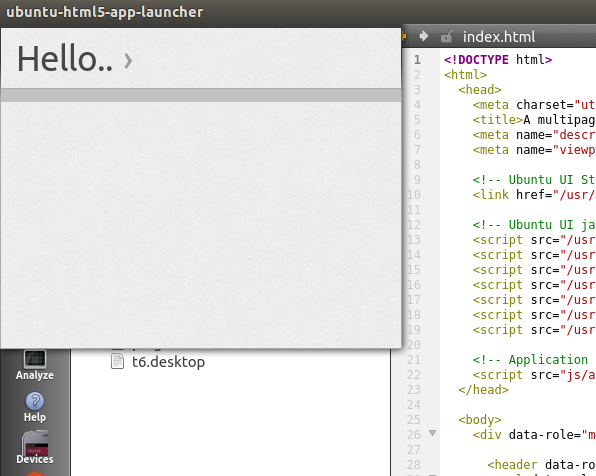 Then you can publish them to the Ubuntu Store for other users to enjoy! If you got lost somewhere, you found a bug or need some help, we're happy to help you. Ubuntu for devices is put together by a community of many people who are eager to work with you. If you have problems or questions, ask on Ask Ubuntu. Join the conversation on IRC in #ubuntu-touch on irc.freenode.net.